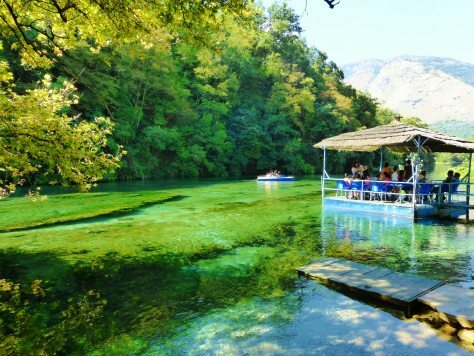 Albanian Legend: How was the “Blue Eye” Water Spring Created? 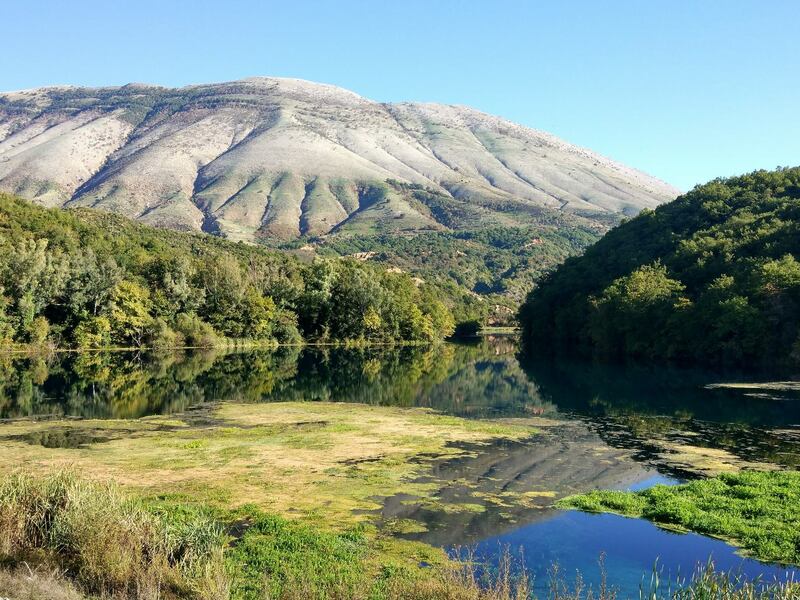 To the children that grew up in the small towns and villages facing Mali i Gjere in Southern Albania, the unusual parallel lines of trees in the mountain slope right at the snowline were no mystery, as it appeared to travelers. They all knew the story of the giant snake (heshderha) that crossed the entire mountain and left his trace that is still visible. Yet the end is the most thrilling part of the legend, but how did it begin? Once upon a time a sudden burst of wind, never seen before, hit the coast of nowadays Saranda and a giant snake came out of the sea. The snake slithered until he reached the small water source of Vrisi in Delvina where a group of women and children were fetching water and ate them all. Later the snake headed to Sopoti mountain (the local name for Mali i Gjere) where he devoured entire herds of sheep and goats and two shepherds and destroyed crops. People were horrified, but an old brave man had an idea. He took a donkey and loaded sacks of straw on it and went near to a cave where the snake found shelter. The old man set fire to the straw as soon as he noticed the snake approaching. The beast swallowed the donkey that continued to burn inside his body. The beast called in pain for his mother, the sea and his sisters the rivers to come to his rescue, but they were not fast enough. 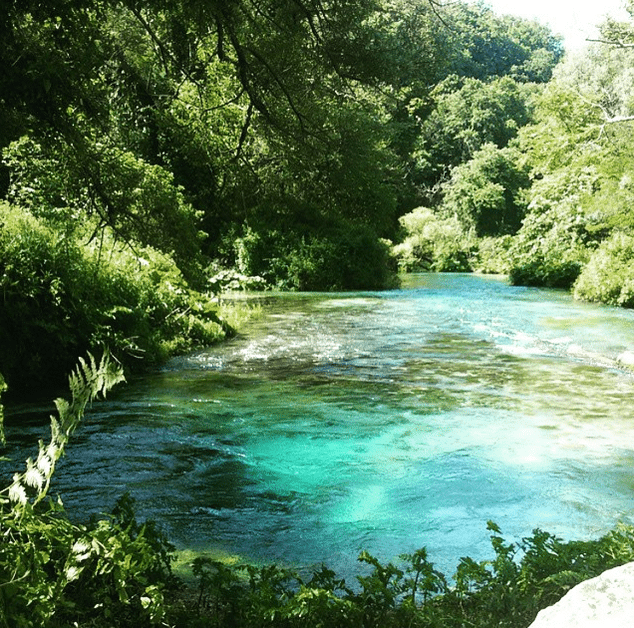 The snake in agony crossed the mountain where he left his trace and upon reaching the place where the Blue Eye spring is now found, his big eye fell and water overflew the land surface and still today, the giant snake’s blue eye continues to cry. Credit to a Delvina native grandmother. 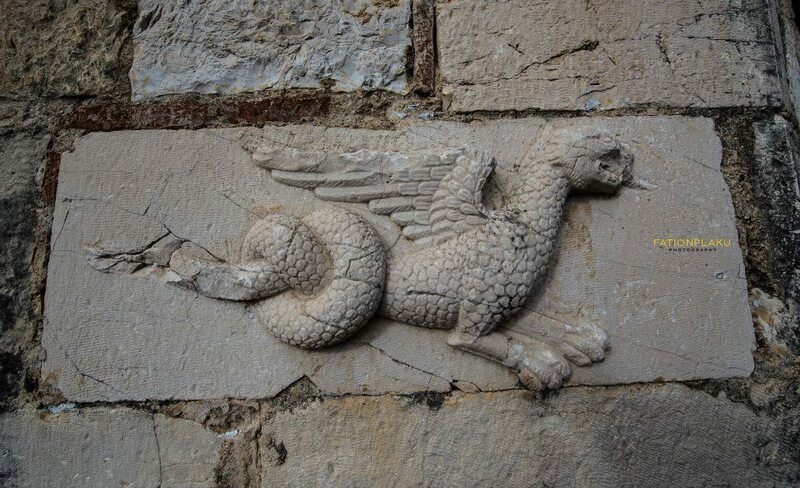 Well-known Albanian Albanologist Robert Elsie mentions in his book ‘A Dictionary of Albanian Religion, Mythology, and Folk Culture’ that the serpent was an important symbol of the ancient Illyrians. However, other versions of the legend mention a dragon. Even this symbol is present in the area of Delvina and Saranda. Engravings of dragons, eagles, lions and other mythologic creatures are still preserved in the walls of Mesopotam Monastery, a religious building that was constructed over a pagan temple. 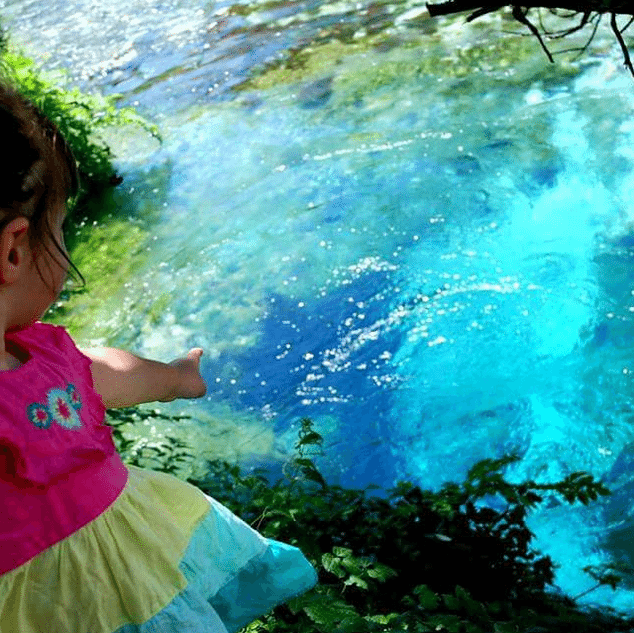 The Blue Eye water spring (Syri i Kalter) is located near Saranda-Delvina-Gjirokastra national roar, two km away from the place known as Dhrovjani salt mine on the other side of Krongji Village. A dirt road runs over the dam at Blue Eye lake and for two km until reaching the destination. 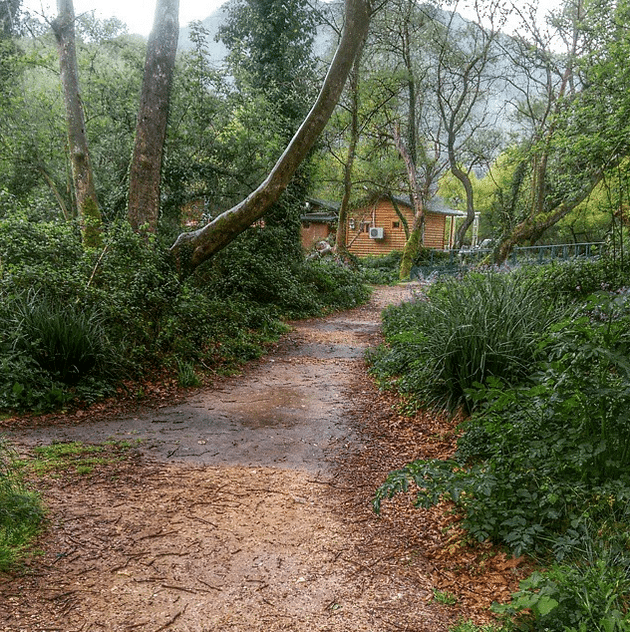 The entire area is surrounded by lush vegetation, giant plane trees, and water streams. It is one of the best settings for a picnic. 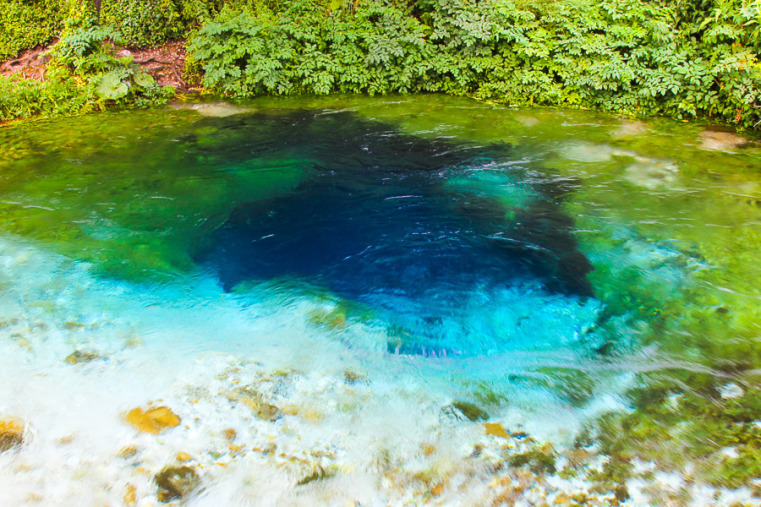 The Blue Eye spring is the largest and most impressive among the 18 freshwater springs in Mali i Gjere area. The natural monument is visited by hundreds of thousands of visitors every year. The color is deep blue at the center of the spring and light blues in the sides. Various expeditions have explored the underwater cave, while scuba divers that reach the depth of 20 meters can sign their names in an underwater notebook. The area around is a green paradise. Water seems to flow everywhere and the park is at the same time blissfully serene and buzzing.